BusOnlineTicket.com is very excited to share with you a new bus service provided by LA Holidays Express. LA Holidays Express now expands their bus service between Johor Bahru and Kuala Lumpur after launching services to Kuantan, Jengka, Temerloh, Bandar Penawar and Sungai Rengit few months back. You can book your LA Holidays Express bus ticket online in advance now at BusOnlineTicket.com to secure your seat before you start your journey! Besides its own brand of express bus service, LA Holidays Express is also the partner of KKKL, providing bus from Kuala Lumpur to Singapore, Kuala Lumpur to Johor, Genting Highlands to Singapore and Genting Highlands to Johor. With their track record of excellent service, passengers are comfortable in taking LA Holidays Express bus services to their destinations. Please note that LA Holidays Express will start the bus trips mentioned above from 31 Jan 2019 with the price from RM 35.00 per way. At this reasonable bus fare, LA Holidays goes beyond the industry standard by offering WiFi service on-board and USB power port at each seat. WiFi service allows passengers to stay connected with family during the bus journey while the USB power port provides convenient device charging point to passengers. The pick-up and drop-off point in Johor Bahru is located at Larkin Bus Terminal while the pick-up and drop-off point in Kuala Lumpur is located at Terminal Bersepadu Selatan (TBS). 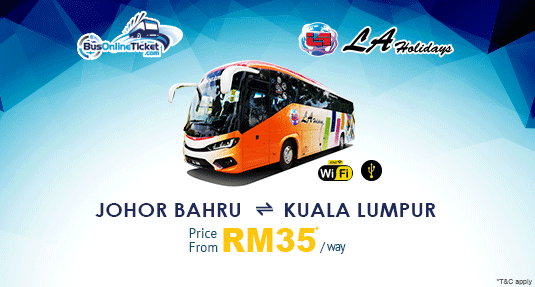 Booking your LA Holidays Express bus ticket between Johor Bahru and Kuala Lumpur via BusOnlineTicket.com is very simple and secure. With our 24/7 online booking service, the nightmare of long queues at ticketing counter is finally over. Instant email confirmation will be sent to you once the payment is received.